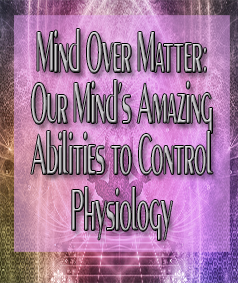 Mind Over Matter: Our Mind's Amazing Abilities to Control Physiology - Better Believe It! We’ve all heard the occasional story where a person defies the normal and uses his or her mind to overcome what we think of as physical limitations. 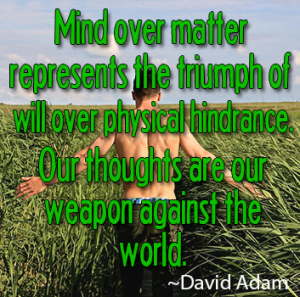 The mind can block physical (and emotional) pain. It can give someone “super-human strength”. It can regulate core body processes like temperature control. Even though these stories don’t happen everyday, if we look closely, we can see what’s possible and train our minds to do what seems impossible. Some of the most interesting stories about the mind’s ability to block or regulate physical pain come from patients who chose to undergo surgery without anesthesia for one reason or another, and who managed their pain by using breathing or meditative techniques or hypnosis instead. BBC News told the story of Alama Kante who had surgery in France to remove a parathyroid tumor in his neck. Instead of general anesthesia, she underwent the surgery using a local anesthetic and hypnotherapy instead. She sang throughout the surgery to determine any collateral damage to the nerves might cause her to lose her voice. Her anesthesiologist, Giles Dhonneur ,said, “The pain of such an operation is intolerable if you are fully awake. Only hypnosis enables you to stand it”. Later, when she described her experience, Kante said, “I let myself be guided. It’s as though I was not in the operating theater at all, I was far away in Senegal”. A Yoga teacher named Yonah Offner also had a tumor in his neck that was to be removed surgically in April 2000. Yonah chose to use a breathing technique he developed called Power Breathing as his anesthesia instead of traditional anesthesia. The technique involves deep, slow breathing through the nose only at three breaths per minute. The surgery went well and he healed normally, although there was a little more bleeding than normal, since traditional anesthesia is often mixed with drugs that inhibit bleeding. Channel 10 News posted a video of the surgery which you can view below. 61-year-old Alex Lenkei is a hypnotherapist in West Sussex, England who also chose to undergo an 83-minute bone-cutting surgery using hypnosis instead of anesthesia. The surgery was performed to treat painful osteoarthritis of the wrist, and the surgeons used hammers and saws to cut the bone during the surgery. Mr. Lenkei said, “I could feel the surgeon pulling and manipulating me – then I heard the cracking of bones“. He further stated that he felt no pain. He handled the surgery well. His surgeon, David Llewellyn-Clark , said, “If he had been grinning and bearing it we would have known – but his heart rate and breathing remained constant throughout”. Sometimes, simply our ability to focus on other things is the way the mind blocks the sensation of pain, instead of practicing meditation, qigong, hypnosis, etc. Consider the case of Dwayne Turner, an Army combat medic in Iraq who received the Silver Star for valor.Dwayne was unloading supplies when his unit came under attack. A grenade exploded, and he took shrapnel in his leg and in his side. However, because of the chaos going on, he didn’t even realize he’d been hit. Despite his injuries, he offered first aid to other soldiers and pulled them to safety. As he worked, he got shot twice. One of the bullets broke a bone in his arm. But in the heat of the moment, he didn’t even recognize his pain and injuries until later when things calmed down. Your brain can focus on the pain and turn the intensity of it up, or it can choose not to focus on it and turn the pain intensity level down. In 1982, Angela Cavallo, a grandmother in her late 50’s, lifted a 1964 Chevy Impala that had fallen on her son Tony while he was repairing it. She lifted the car about 4 inches and held it up while a neighbor dragged the unconscious Tony out from underneath it. In February 2006, Lydia Angyiou of northern Quebec remained unharmed after she engaged in a hand-to-hand street fight with a polar bear who she felt was going to kill her son and his friend. In July 2006, Tom Boyle saw an 18-year-old bicyclist get hit by a car and get dragged underneath it. The boy was pinned under his bicycle which was pinned under the car. Boyle lifted the Camaro up and then reached underneath to pull him out. In 2009, Nick Harris lifted a Mercury sedan off a 6-year-old girl who became pinned underneath it. Scientists believe these acts of amazing strength happen when intense emotion (i.e., fear) signals neurons and the adrenal glands to release epinephrine (or adrenalin). Epinephrine increases blood flow to muscles, increases the output of the heart, and dilates the pupils. Increased blood flow to the muscles floods the muscles with the hormones and nutrients it needs to perform at its best. The body has a long list of autonomic processes – those activities it carries out all the time that are normally not under your conscious control. Examples include breathing, digestion, immune system activities, temperature regulation, etc. But can you bring them under conscious control and use the ability of your mind to improve your physical condition? There are people who have done exactly that. We’ve already touched on the ability to control your breathing which can help with blocking pain sensations, improving focus, reducing anxiety, and improving the immune system, to name a few benefits. Remember Yonah Offner who regulated his breathing to 3 cycles per minute? We all know that our thoughts and emotions can have a profound effect on our digestive system. How many times have you gotten really upset, and the first place you feel it is with an upset stomach (or nausea or acid reflux or irritable bowel)? And while it was determined that H. pylori was the cause of most stomach ulcers, a 2003 study showed that, while nearly all peptic ulcer patients have H. pylori, only a small number of people with the bacterium get peptic ulcers, suggesting that some other factor, maybe psychological, might be necessary for H. pylori to cause ulcers. Several studies, in fact, have shown that this other factor might be chronic anxiety. The study has found not only a statistically significant link between chronic anxiety and peptic ulcers in a large population sample, but a connection between the amount of worrying people do and their risk of peptic ulcers. In fact, your gut has its own nervous system called the “second brain” or “enteric nervous system” (ENS), and it communicates with your brain in a two-way fashion. There is a higher incidence of irritable bowel syndrome among people with anxiety and depression, and it’s thought that one might contribute to the other. In fact, a review of 13 studies showed that patients who tried psychologically based approaches had greater improvement in their digestive symptoms compared with patients who received only conventional medical treatment. Additionally, another study on mice showed that by switching one group of mice’s gut bacteria with those from another group, it led to changes in the behavior of the 2 groups. There is mounting evidence that indicates gut bacteria influence behavior and psychological states. This study showed that mindfulness meditation reduced pro-inflammatory gene expression and decreased levels of C-reactive proteins. High levels of C-reactive protein are an indication of inflammation, and inflammation has been linked to a lot of chronic conditions such as heart disease and cancer. Researchers at UCLA showed that mindfulness meditation stopped the decline of CD4+ T lymphocytes in HIV-positive patients. CD4 cells (often called T-cells or T-helper cells) are a type of white blood cell that play a major role in protecting your body from infection, and the HIV virus destroys them. In this study, 48 biotech workers who practiced mindfulness meditation for 8 weeks showed a higher level of antibodies to the influenza virus than the control group who didn’t meditate, showing that meditation can boost antibody production. Research on “Iceman” Wim Hof suggests that he can influence his autonomic nervous system and immune response through concentration and meditation. To test this theory, he was administered a bacterial endotoxin while practicing his concentration and meditation technique. During the experiment, various measurements were performed, including brain activity, autonomic nervous system activity and inflammatory mediators in the blood. On average, Hof’s immune response to the harmful bacteria was decreased by 50 percent compared to other healthy volunteers. In addition, hardly any flu-like symptoms were observed, as they were in the other volunteers. Hof believes he can teach his methods to anybody, and many celebrities have signed up to learn what he knows. Tibetan practitioners of g-Tummo meditation (a form of meditating/breathing/mental imagery) have been shown to be able to raise their increase their body temperature to over 100.4 degrees (38 Celsius). This ability could help in boosting immunity to fight infectious diseases or immunodeficiency. Wim Hof can raise or lower his body temperature at will, overriding his autonomic nervous system. He is able to sit in a box of ice for almost two hours. He can swim 50 meters under arctic ice. Wearing only shorts and going barefoot, he has run a marathon in Lapland and climbed through snow to the summits of Mt. Everest and Mt. Kilamanjaro. In carrying out these feats, he is able to avoid hypothermia. Monitoring by physiologists show that he keeps his core temperature constant and normal during these challenges. He offers courses to learn his methods here. Examine the definitions you hold in your mind about what’s “possible” or “impossible”. Do any of your definitions need upgraded? Learn and practice mindful meditation. When in pain, try to focus on something else. Listen to music, as science has shown it lessens pain (choose soothing music). Try some intense thinking to reduce painful sensations. Learn some structured breathing as presented in various yoga programs, or Power Breathing, or take Wim Hof’s training. What do you think? Share your opinion in the comments below.